With clicker training your dog learns motivated and creative the desired behaviors: Also suitable for cats and horses! With tone control. The clicker makes a clicking sound by pressing the metal part with the thumb. When using the training clicker during the education of animals, it provides clear and precise communication between trainer and dog (cat, horse) and allows you both to enjoy the training/education. You click at the exact moment the animal is performing whatever it is you wanted from him, and since you always reward that click with a tasty snack/treat, the animal will learn to like the sound so you give your animal a clear signal that it has obeyed correctly. Most dogs( and other animals) have a very good and sensitive hearing. 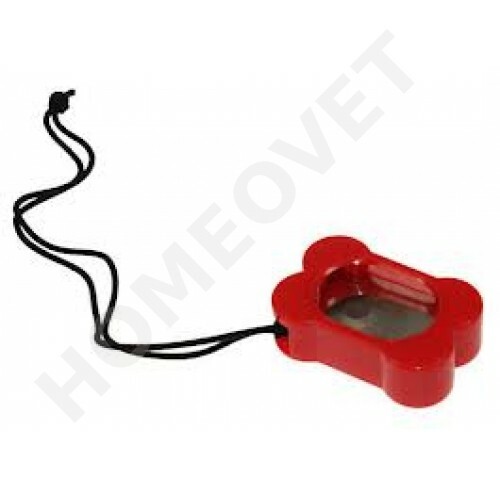 We ask you therefore to set the volume / tone switch, located on the back of the clicker, in one of the four positions which suits your dog best.